Former Nokia exec: "I did not see a good reason to change course so frantically"
Nokia is in its worse shape right now, undergoing what seems to be the toughest times of its transition to Windows Phone for its main platform, but what scares former Nokia executive Lee Williams is the lack of any strategy besides WP, and current Nokia head Stephen Elop acting more like a financial director rather than the CEO that will lead the Finns out of the gutter. Williams who ran the Symbian Series 60 platform between 2006 and 2009, gave a detailed interview for CNET. He was also the executive director of the Symbian Foundation. "As an arm chair quarterback, it is clear to me that Elop is struggling. The results speak for themselves," Williams said. And the latest credit rating downgrades only confirm that - Standard & Poor’s, Moody’s and Fitch have all downgraded the Finnish company, and most recently Fitch gave its stock a junk rating. "Those credit ratings are a huge deal for them," Williams added. "If they can't borrow and move money -- wow! There's very little for them to do. Because they're the world's largest distributed manufacturer highly dependent on that movement and those credit ratings, and cash and bank." "Elop is operating like a CFO [chief financial officer] -- CFOs are very practical, always looking at costs, always internally focused... I don't think he's really projecting anything forward or sitting around with his team imaging what the future looks like. I think it's 's**t how do I get rid of a third of this overhead in R&D?'." "I did not see a good reason to change course so frantically," Williams summed up Nokia’s transformation to Windows Phone. "I don't think Nokia was going in the wrong direction with some of the things it was doing -- it was simply executing poorly before Elop got there and they weren't giving it enough time. He lost his talent and he's bringing junior people out of Microsoft into key roles and positions, especially in sales. Inventory in a company for anybody but the CFO is talent. For the CFO it's not talent, it's assets, IP, offices -- so again Elop's acting like a CFO." He nails his point by comparing current struggling Windows Phone sales to sales of Symbian. "Symbian is shipping on around 20 million new units a quarter as of today. When I was at the company it was responsible for seven of 10 of Nokia's highest gross margin products. Think of those volumes. There were dozens of products that shipped in the tens of millions. "For some perspective, everyone is thinking Lumia and Windows Phone when they look at Nokia now, and from what I can tell they have yet to have a product with this configuration ship close to two million units." The former executive realizes that Symbian couldn’t carry Nokia through these very competitive times, but he points out it fares better in battery life and imaging than Nokia’s Lumia lineup. Nokia’s handset revenues are still hugely dependant on Symbian, and last quarter’s decline in Symbian sales had an immediate devastating effect for Nokia with revenues from devices taking an unprecedented plunge. Former Nokia executive Williams has a couple of ideas of how the Finns can get out of the gutter, and interesting ideas about Android and other options that were open to Espoo. Check out the interview below for a full picture of what could save the Finns, and let us know whether you agree or not in the comments below. What a useless, bitter guy. He sounds like he's pitching for Elop's position, while admitting that on his watch Nokia sacrificed its brand and just pushed out phones that were lagging behind competitors. There's a reason he's "ex" Nokia, I would suppose, and reading his comments about how great Symbian was and that Nokia apparently would have been better off staying with it, makes him less than credible. "Could not see a good reason for changing course"... maybe he's seeing it now, with Nokia shares at an all time low? Williams and guys like him (e.g. Olli-Pekka Kallasvuo) were responsible for Symbian falling behind its competitors tech-wise, Nokia losing its touch and then its market grip. Granted that Elop's moving away from Symbian could have been more smooth, but WP is undoubtedly the better option for Nokia at this juncture, and we will have to see at this time next year how it works out. Let's see that too, by that time Android, iOS, Bada and few new born OS will cross MS. They can better be in desktop for sometime..
Lee Williams is speaking a lot of sense. MBA students of the future will be studying the implications of that disastrous "burning platform" announcement by Elop. No matter how successful a company is, if the big Boss makes disparaging remarks about his own products how on earth can you expect to gain customer confidence and loyalty when the Boss doesn't believe in the product he sells?! Couldn't have said it better! Who wants to buy a Nokia Symbian phone knowing it will be discontinued or a MEEGO phone knowing it won't be supported by them? While I think WP7 is a better OS than Symbian, it was very foolish to anounce in February that WP7 is the future and Symbian is dead. Especially when they did not even have a WP7 phone out yet (nor would they for like 9 months). They should have gradually built up a WP7 market, and once established start phasing out Symbian. They would not be in the spot they are in now. I still think the move to WP7 was the right one, it was just stupid to announce it so far in advance of product availability. well if Nokia sees success tomorrow where will u keep your face.. i agree Nokia is not as before.. how many years did android take to set its position as of today?? y did Nokia lose its spot?? because U stopped developing symbian and now u r talking.. talk people talk.. Nokia will bounce back.. u ll c after the launch of apollo.. Nokia+win8+dual core+720p screen+pureview cam technology=grand success..
Couldn't said it better myself! All people say is Android, Android, android.....Why do I have to have what everybody has?? I like to have different choices. Stop your fanboism and enjoy your smart phone. Great. Nokia is still a $BILLION company. Let us know when another $BILLION company is in bad shape. Nokia made a bad bet. I would've considered Nokia again if Nokia had sticked to MeeGo or if they had released an Android phone. The fact that he's an Ex-CEO makes his statement uncredible, its full of jealousy. During Symbian days, i was doing beta testing of some symbian apps. So i had very close communication with developers. I realised that iOS, Android and Windows Phone are the future of smartphone, as Symbian framework is stuck with the part. It is like symbian has been fully used up and it was difficult to implement new stuff without sacrificing some. This guy is targeting Elop performance, but it was this guy who was also responsible for keeping for turning blind eyes on other competitors OS. Look how long Meego was taking, now Tinzen. Symbian started improving until Belle update came out, this under Elops management. I'm glad Nokia chose Windows Phone, Best phone manufacturer in partnership with an Experience OS company. Though it will take years to catch up. Boy, the anti-WP articles are popping up a ton, huh? Look, I felt Nokia would have been smart to keep a line of Symbian devices going until their WP devices were established, not just outsource the support for it. But, really folks, why is everyone so excited to see Nokia and WP fail? The 800 and 710 have been out since about November, and the 900 has just been released. None of those are in all markets, and their Tango offerings haven't even been launched yet. Nokia can easily become a top flight company again and have a much better profit per handset by not having to fight to keep up R&D on software. Give a year, maybe a year and a half. If they bomb, than kick them. I am sure we can find an ex-Google employee back in 2005 or so that said how dumb they were trying to launch Android when BlackBerry and the iPhone were king, Palm was a force to be reckoned with, and Microsoft had Windows Mobile on a ton of devices. How smart would he look right now? It's true that there's a lot of strong feelings around Nokia and some opinions seem to be escalating that even further. Now many of you in the comments have rightly noticed how polarizing and extreme some opinions seem, down to the point that they're conceived as anti-Nokia. And indeed they are if you accept Stephen Elop as the face of Nokia. But let me take a moment to explain why Nokia is different than Google, where is much of that sentiment coming from and why for many Nokia and Elop represent different values. First of all, it's the facts that are particularly troubling. Not many people would have cared deeply if Google failed Android in its infancy. The thing is Google had no experience in mobile, it was a beginner and it got the free pass a beginner deserves. On the other hand, there is Nokia, which is in a totally different position - it's the company that invented the smartphone, and led the market for 14 years. 14 years! Just imagine how long that is in a place that's changing from the ground up every year or so. Next come the numbers. Nokia sales have plunged and fallen so hard (from the top, remember) that it's shocking. And it's particularly sad for all those people that cared for Nokia and Symbian. You'd notice that many of the loudest voices urging Nokia to fire Elop and take a strategy where Windows Phone is not the one and only platform, are exactly ex-Nokians or people specializing on the company: Tomi Ahonen, Lee Williams, Russian long-time Nokia insider Eldar Murtazin, the list goes on. Those people have a clear vision of the core values Nokia stands for in their minds - innovation in mobile platforms, support for open standards and technologies like Symbian and QT, features like universal Bluetooth support, expandable memory, removable batteries (mostly lacking in iPhone, WP). Stephen Elop devaluates all those achievements by writing off Symbian pre-maturely, and that's where it all starts to get emotional. That's where there is a disconnect between the "old Finnish Nokia" and the new US-centric Nokia. Finally, I'll wrap this up by saying that we (me in particular) are analyzing and propagating sentiment voiced by those people mostly because the numbers support it. I feel that ex-Nokians deserve to have their voice heard in the midst of brand devaluation and some catastrophic financial results for the Finns. Of course, we're equally open to reporting Nokia's official position, but it's just a matter of representing both sides of an argument. Vic, when you write an unbiased article about Nokia and WP, please let us know. Because this ain't it! You're one of the worst offenders here at iPhonearena. All you do is BASH everything else except for that app launcher with telephony that pretends to be a smartphone. As much as I agree with those standards, for someone who had to own the HORRIBLE Nokia 5800 XpressMusic for a year and a half - even APPLE for me is better than that when it comes to releasing a usiable product. Yes, Symbian had all these open standards I - and many others cherish so much - but they were delivered in such a horrible package (resistive screen. UGH), and in such an underwhelming UI (lot's of menus, lagging software, lack of basic elegance, etc), that I prefered to have an iPhone, which is of course significantly less usable, but at least is comfortable to use. That's why I love Android. It has all the open standards Symbian had (BT file transfer, SD card support, customization, total control, etc) while combining all that in a good hardware package (with a capacitive multi-touch screen and a strong enough-processor), all the while giving the user a slick and comfortable UI. Yes, there are some menus but nowhere near what Symbian used to have. Nokia fans should see Android as the evolution of symbian - it has all the same good features, while getting rid of all the bad ones as well. I have not had the privilege of trying MeeGo, so I am going on the glowing support of those like you. The reviews I read and the online videos of it did indeed look promising. So I understand. But MeeGo had the same problem in the eyes of the Nokia board as Symbian when they hired Elop- the development of it was all on them. Their R&D was a huge, profit draining burden. None of the apps or tools for Symbian would work, and all that had to be done. Meanwhile, all the Symbian handsets had to be supported. Sometimes people forget that the people who hired Stephen Elop wanted change. If they had gone Android, I am sure it would have been a sure thing. But, Nokia wanted to be different, and wanted a partner willing to invest in them. Microsoft was it. Gotta love Victor H., no doubt he'll find negative articles towards WP and post up an article. 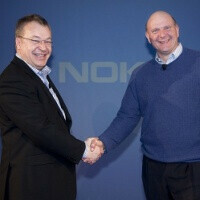 Many people have been predicting the end of nokia for a long time now, most of those predictions have not come to pass. I would love to see these tech sites write an article whenever nokia beats the odds like when some analyst predicted that they wouldn't be able to sell 1 million lumia 710's and 800's, they have so far sold more than 1.5 million of those and they have only been available in few places. Williams is right to an extent. But what caused the problem was the Burning Platforms Memo - where Elop killed Symbian and Meego and announced WP strategy The major problem was that they had no WP phones to show to the world (Lumia phones only arrived late 2011) and that they were still releasing Symbian phones throughout 2011. But because he osborned his own products, nobody was going to buy them - so sales crashed. People say that Nokia was doomed because of the rise of the iPhone and Android phones. No doubt they were a contributing factor to the gradual decline, but even in 2010, Nokia still had a massive worldwide presence. Before the Elop effect (combo of the Osborne and the Ratner effect) in Q4 2010, Nokia was at top with 33%, 75% in China, 70% in India, 60% in Singapore. In fact it was the market leader in every market apart from USA. They already had a migration strategy from Symbian to Meego with Qt, and they had a contract with China Mobile (the biggest network carrier in the world) that they will use Meego so in effect Nokia could have had 12% of the world's mobile phone market share. Also NTT DoCoMo had agreed to use Symbian on their smartphones. (Since Nokia's annoucement, both have moved to Andriod) So really overall, things were looking good. There was no real need to move to WP. To put it into context, Nokia was selling twice as much smartphones than Apple in 2010 having sold 100.3M units compared to 47.5M units. Apple's worldwide smartphone sales market share was 15.9 with Nokia's 33%, with RIM at 16%, Samsung at 8%. Worldwide smartphone OS market share in 2010 was; Symbian - 39% Android - 18% iOS- 16% Blackberry -16% Worldwide smartphone install base 2010: Symbian - 49% Blackberry - 17% iOS - 11% Android - 9% To say that Nokia's presence in 2010 had diminished to the point that they had to move to WP would be factually incorrect. Even if Nokia had to go to WP, the Burning Platforms Memo was a terrible terrible idea, wiping huge amounts of profit and market share and destroying carrier and consumer trust in the Nokia brand. If Elop was sensible, he would have announced it much later, like when he has a WP phone to show to the world. Of course, now, it is impossible to go back to Symbian/Meego because Elop destroyed it. What you're saying doesn't make much sense. It is very naive to assume that one person has the power to by himself make decisions like adopting WP as the main platform, regardless of him being the CEO. This fancy Elop effect mumbo jumbo is a result of some MBA wannabe reading on Wikipedia without understanding the realities of business. Not only does it assume that Elop broke the news that Nokia's platform was behind competitors before consumers knew themselves, it also pre-empts the conclusion to Nokia's fate. That said, the infamous memo could absolutely have been handled better and does give the impression that Elop wanted to be seen as an action guy. Turning a company around that has fallen so badly behind due to complacency and management short-sightedness as Nokia did, takes time. Elop has been in charge for a year and a half, and it's gonna take at least another half a year to see how good a job he's doing.